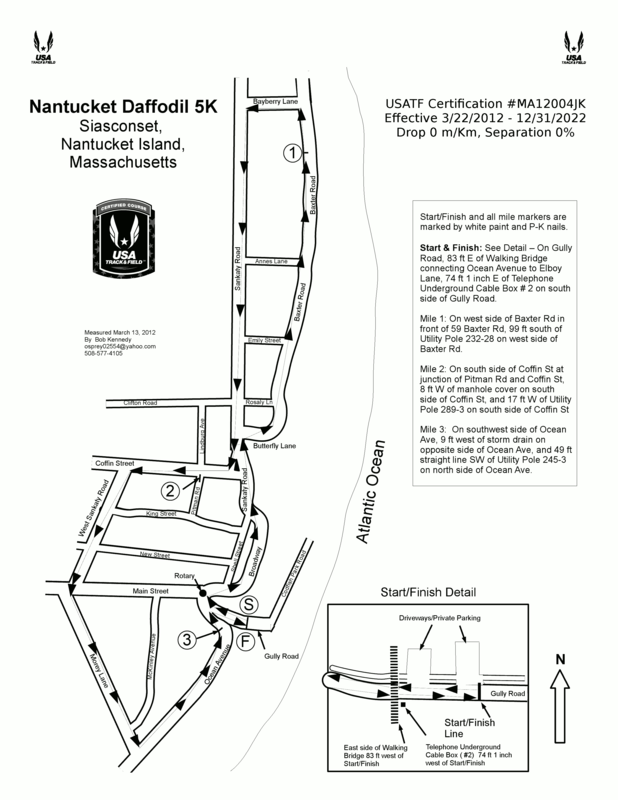 The Nantucket Triathlon Club presents the 9th Annual Nantucket Daffodil 5k! The 5k race begins and ends at Codfish Park under the pedestrian bridge in the historic village of ‘Sconset on Nantucket Island. The course winds through quaint ‘Sconset Village, along Baxter Road and the ‘Sconset Bluff and finishes with a gorgeous view of the Atlantic and a fast downhill finish. This course is flat, fast and scenic! Join us for your 5k PR!! Racers registered before April 6th will be guaranteed a t-shirt, after that sizes and availability are on a first come, first served basis! Please register early! Early bird registration prior to April 19th is $30. Registration fee increases to $35 after April 19. Youth ages 18 and under are $20. Nantucket Triathlon Club members please contact us for a discount coupon code!! Registration and packet pick-up will be available on Saturday afternoon, April 27th, from 3:30 – 5 pm at the Handlebar Cafe at 15 Washington St. as well as race morning at the start line in ‘Sconset beginning at 7:45am. Race begins and ends on Gully Lane near Codfish Park. Sharp Right downhill to Finish Line on Gully Rd! All intersections will be signed and staffed with a volunteer!